The Two Faces Of January directed by Hossein Aminia (UK/USA/France) 2014 was the opening night film of the 57th San Francisco International Film Festival. The noir Sixties thriller predominantly takes place in Athens, with scenes on Crete, and a climactic sequence in Istanbul. It’s based on the Patricia Highsmith novel by the same name. It screened to a packed crowd at the Castro Theatre and was followed by a brief conversation with the director. The festival continues with 167 films to be shown over the next two weeks in three Bay Area venues: the Sundance Kabuki Cinemas, New People Cinema, and Berkeley Art Museum & Pacific Film Archive. Contact the San Francisco Film Society for more information and tickets. Counting Happiness directed by Venetia Evripiotou (Greece/India) 2012 was the first of three short works on the opening night of the San Francisco Greek Film Festival. Most of it was shot outdoors somewhere in urban India. It follows a young child who spends most days trying to sell wind-up chicks on the street. Rosmarinus Officinalis directed by Andreas Siadimas (Greece) 2008 is about an unexpected encounter between a couple lost on their way to a scientific conference in Chania and a mythic Cretan well-versed in the medicinal properties of plants. It set the comic tone for the films that followed. The Foreigner directed by Alethea Avramis (US/Greece) 2011, unlisted in the festival program, was a wonderful surprise and definitely a highlight of the evening. 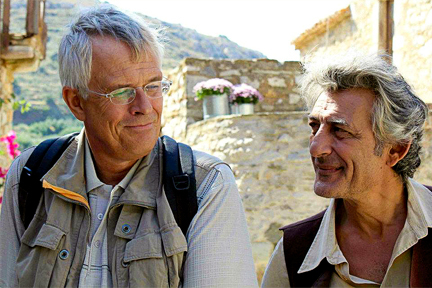 After the mayor of a remote Greek village receives notice that government services are to be cut at the end of the month because the population fell below 35, he seizes the opportunity to rectify the situation by encouraging a British tourist who stumbles on the village to settle there. During the Q & A that followed, the director revealed that a feature-length narrative with a Swedish producer is now in development. Small Crime directed by Christos Georgiou (Greece) 2009 is a full-length feature about a young ambitious policemen stranded on a backwater island who tries his best to distinguish himself so he’ll receive a promotion and transfer to a more interesting post. When he recovers the body of a man at the bottom of a cliff, he launches a full investigation despite the hostility of nearly everyone around him.